Paul Hogan (left) and Rod Ansell (right). His story is even wilder than the movie. The 1986 movie was made on a $10 million budget as an attempt to create an Australian movie that would perform well overseas. 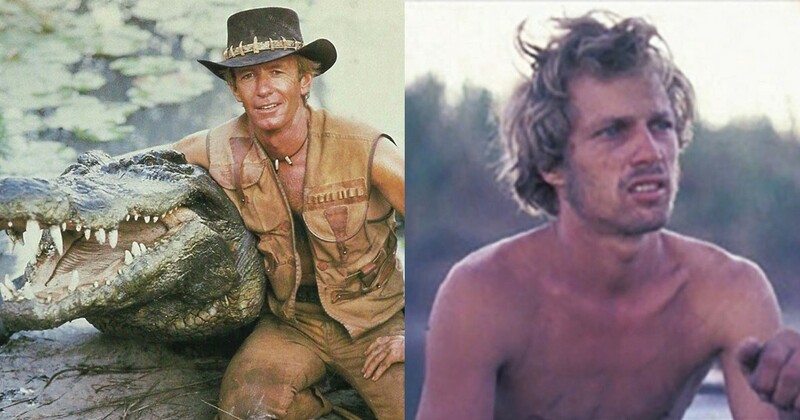 Star Paul Hogan got the idea to tell the story about a “bushman” in the big city after a visit to New York, but the real inspiration for Michael J. Dundee was actually a very real dude who knew his way around the outback. From an early age, Rodney Ansell had a passion for Australia’s wild spaces. At 15, he moved from Queensland to the Northern Territory and started hunting wild buffalo and selling the meat. Returning from one of those trips in May of 1977, Ansell decided to take a fishing trip on the Victoria River with his two bull terrier puppies for company. That trip would end up changing his life in ways he could never have expected. While traversing the river, a mysterious object capsized his 18-foot motorboat. Ansell claims it was a whale, which is… dubious at best. It was more likely a large crocodile. Whatever it was, it sent Rod scrambling to save whatever he could from his dinghy. When the smoke cleared, he was left in the tiny one-oared boat with some canned food, a knife, a rifle and the two puppies — one of which had a broken leg. He passed out and the dinghy drifted out to sea, washing up on an island by the mouth of the Fitzmaurice River. That island would be Ansell’s home for the next 56 days as he struggled for survival. He wasn’t able to get fresh water for the first two days and, delirious, ended up shooting wild cattle and sucking their blood for hydration instead. He also caught bees and tied threads to their bodies so he could follow them back to their hives and harvest honey. At night, Ansell slept in the crook of a tree with his dogs to keep out of the reach of hungry crocodiles below. The buffalo hunter didn’t hold out much hope for rescue — he’d told his girlfriend he planned to be away for months, so no search party was ever dispatched. But one day, Ansell heard the sound of horse bells and ran to meet a pair of aborigines and their Caucasian companion on walkabout from a reservation over a hundred miles away. They brought him back to civilization and once the media got ahold of the story Ansell became a nationwide celebrity. He wrote a book about the experience called “To Fight The Wild” and starred in a documentary of the same name. But eventually he decided to return to Top End and hunt buffalo again. When Paul Hogan was coming up with inspiration for his movie, the story was a natural fit. The filmmakers admitted that Ansell was the real-life Crocodile Dundee, but he never saw a dime from the film. To add insult to injury, when Ansell wanted to start up a business called “The Real Crocodile Dundee Adventure Tour” on his farm, he was threatened with a lawsuit from Paramount Pictures. The decline of the buffalo population coupled with invasive weeds making the floodplain unfit for grazing destroyed his business in the 1990s. He eventually lost his ranch and was forced to move away from the land he loved. Ansell began growing marijuana instead, getting into illegal drugs to cope with his pain and frustration. He shacked up with a woman named Cherie Ann Hewson on the outskirts of the Urapunga aboriginal reservation. The natives inducted him as a white member of their community, but all was not well in his household. In 1999, he ambushed a pair of police officers at an intersection, fatally shooting one of them before dying in the ensuing gun battle. His autopsy showed he was high on methamphetamine and neighbors reported him ranting about Freemasonic conspiracies to kidnap his family. The real Crocodile Dundee was given a full Aboriginal burial in Arnheim Land, an inauspicious end to the inspiration for one of Australia’s most popular exports.